Currently, there is a flurry of documentaries about criminal justice reform. 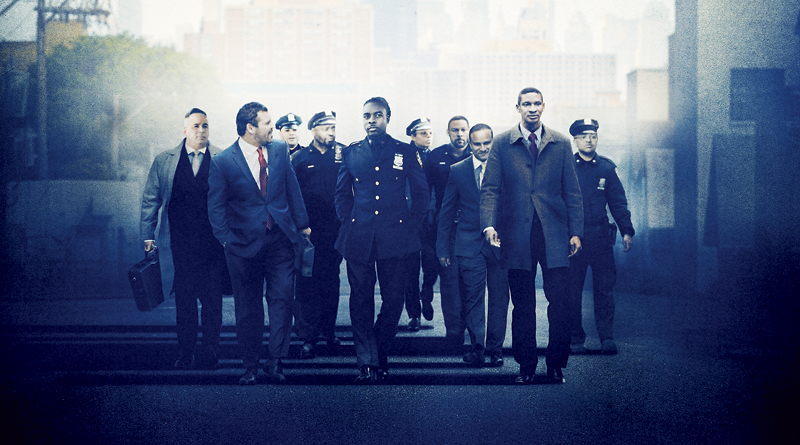 On Hulu, v, directed by Stephen Maing, follows a group of NYPD officers who go against the department in an effort to bring down an illegal quota system that was leading to a disproportionate number of people of color facing tickets, summons, and jail time for minor infractions, real or otherwise. The sprawling documentary covers not only the officers and the cost they paid for speaking up, but also citizens who were adversely affected by the quotas. It takes a deep dive into how this system came about and how the group of officers pushed back. Although thoroughly researched and made with a keen attention to detail, often the pace of Crime + Punishment is so slow and the scope so large that the story became hard to follow. I have a lot of interest in the subject matter and I even found myself drifting. I do recommend the documentary for those interested in the subject, but a more easily digested approach to the topic can be found in the recent episodes of the podcast Reply All, “The Crime Machine Part I” and “Part II”. The podcast covers the story in a simpler and more engaging manner that makes the complicated turns of the story easier to follow. A documentary that I recommend more enthusiastically is Bombshell: The Hedy Lamarr Story, directed by Alexandra Dean and streaming on Netflix. Hedy Lamarr was a gorgeous Hollywood actress who worked for Metro-Goldwyn-Mayer starting in the late 1930s. She was also a bit of a genius and, with no formal training, she invented a frequency-hopping system that was used in Naval ships and later helped in the development of Bluetooth and WiFi. The documentary covers Lamarr’s career, inventions, and her lifelong struggle with mental illness. Her story is a fascinating look at a woman who defied expectations and is both timely and compelling. The documentary navigates the complicated story with sufficient detail and sympathy and produces a portrait that resonates with some of the issues around gender and creativity of our time, too. If the fall weather and longer nights still have you in the mood for something supernatural, both Hulu and Netflix have a series for you to stream. On Hulu, Light as a Feather is a good option for fans of shows such as Pretty Little Liars. Light as a Feather centers on a group of high school girls (Liana Liberato, Brianne Tju, Ajiona Alexus, Peyton List) who play a game of Light as a Feather, Stiff as a Board on Halloween night and, one by one, begin dying in ways described by new student Violet Simmons (Haley Ramm) during the game. As the girls cope with their grief, they also get caught up in a web while investigating Violet’s secrets and lies. The show starts out strong as the creepy elements and the central mystery get the audience hooked. As the episodes progress, however, the story gets more juvenile. The acting is on par with other TV teen dramas, as is the production quality, which is to say that the show is entertaining, but not especially high-quality. Netflix’s The Chilling Adventures of Sabrina is a bit more sophisticated of an option. The show stars Kiernan Shipka (who you probably remember as Sally from Mad Men) and is a new incarnation of Sabrina the Teenage Witch and features a darker tone and a mid-century vibe. The acting on Sabrina is often oscillates between wooden and cheesy, but the story is intriguing and the style of the show is both eye-catching and fun. I was hooked by the moment in the pilot when Sabrina and her friends dissect the political undertones of the zombie movie they’ve just watched. The show has many winks like that for the audience, making it a clever, if sometimes also silly take on the teenaged witch. The show also has some eerie or scary moments that contribute to its darker, more mysterious tone. This is not the Sabrina we enjoyed on TGIF, but it is definitely worth trying out. ← HAPPY 50TH ANNIVERSARY, REDDINS!